Autumn leaves are falling rapidly around the northwest and it’s earnings time for Harley-Davidson. Will it be continued progress or sputtering along? We’ve got a crisis in America. No jobs. And those with the money want to keep it! We live in a society. And right now our society is not cohesive. It’s about the haves and have-nots. Those who want to be in everybody else’s personal business under the guise of freedom and those who want to be able to pursue happiness in their own individual way. 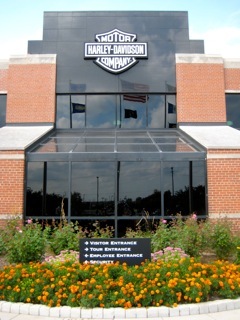 “The Harley-Davidson brand has remarkable strength globally. Few products or brands rank as highly in terms of awareness and affinity on the part of customers and non-customers alike. We have continued to gain market share in the U.S. and Europe. Since 2008, we also have been the U.S. leader in new motorcycle sales to young adults for the entire on-road motorcycle category. Going forward, we will continue to build on this brand strength and leadership position,” said Wandell. One bright spot was operating income from financial services (HDFS) was $50.9M in Q3, 2010, compared to an operating loss of $31.5M in the year-ago quarter. The improvement in year-over-year operating income is largely the result of a lower cost of funds and improvement in credit losses. Photo taken in Milwaukee during 105th Anniversary.